To help the nearly 1,000 individuals seeking food assistance from the Franklin Food Pantry, the Pantry is again partnering with the Franklin High School Empty Bowls Club in the 3rd Annual Empty Bowls Dinner on May 1, from 6 – 8 p.m. at Franklin High School. The dinner event, which features a simple meal of soup and bread served “soup-kitchen” style, will set the stage for community members to learn more about the true effects of hunger. Featured speaker Erin Lynch, Pantry executive director, will present “Hunger in Franklin,” highlighting the impact of hunger on struggling local families. Lynch’s talk will be at 6:45 p.m., but the open house format welcomes attendees any time between 6 – 8 p.m. 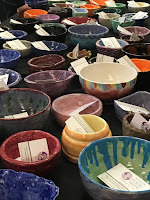 The event includes a silent auction featuring more elaborate pieces that have been created and painted by members of the FHS Empty Bowls Club and community members. In addition, kids of all ages will have an opportunity to make a bowl to take home with them. Donations made via the Giving Wall will be used to purchase food for neighbors in need. All proceeds from the event will benefit the Franklin Food Pantry and will be used to fight hunger locally. Tickets must be bought in advance and can be purchased online at www.franklinfoodpantry.org. Seating is limited to 350 guests so tickets will be sold on a first-come, first-served basis. Depending on advance ticket sales, tickets may be available at the door. The cost is $20 for adults and $10 for children and students. Empty Bowls is an international grass roots effort to fight hunger and raise funds to support local pantries. The Franklin Food Pantry and the FHS Empty Bowls Club work together to support the cause locally. For more information on the dinner, visit www.franklinfoodpantry.org or call 508-528-3115. Franklin High School is participating in an international charity project called Empty Bowls, which supports hungry people in local communities. The objective of the Empty Bowls Club is to teach students of all ages that they can make a difference in their local community. Club members, along with FHS faculty, district K-12 art teachers, and the Franklin community, make ceramic bowls throughout the year. Then, the Empty Bowls Club and the Franklin Food Pantry work together to co-host a community meal of soup and bread. All funds raised at this event are donated to the Franklin Food Pantry. The Empty Bowls Club has been sponsored by the Franklin Cultural Council. The Franklin Food Pantry offers supplemental food assistance and household necessities to nearly 1,000 individuals. Clients have access to bread and fresh produce daily during Pantry hours. As a nonprofit organization, the Pantry depends entirely on donations, and receives no town or state funding. Other programs include a Mobile Pantry, Cooking Matters classes, a Healthy Futures Market, emergency food bags and holiday meal packages. The Pantry is located at 43 W. Central St. in Franklin on Route 140 across from the Franklin Fire Station. Visit www.franklinfoodpantry.org for more information.